This is a café on the way from central Brixton up towards Tulse Hill. 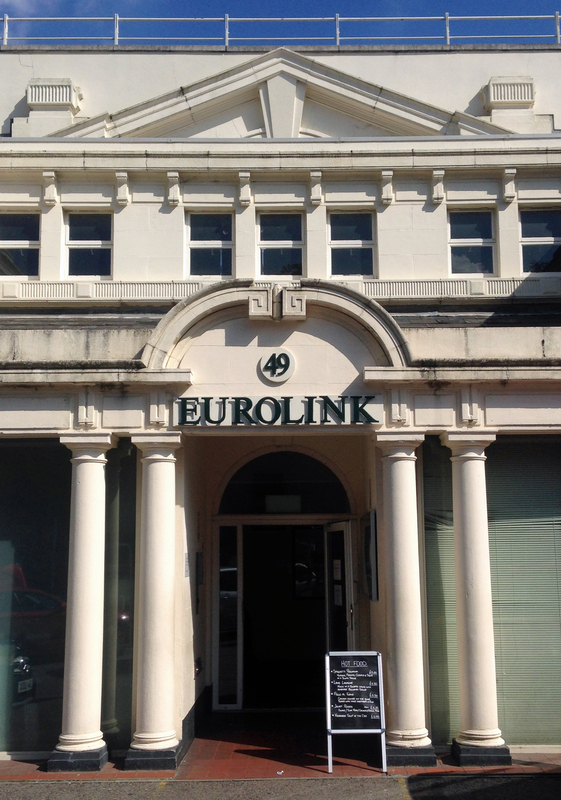 So it’s a little out of the way and difficult to spot as it is within the distinctive white Eurolink Business Centre (previously Brixton’s Synagogue). The café is well advertised in the car park. It is a small light venue that is open for breakfast and lunch. They provide sandwiches for the people who work on the premises, which provides space for many small business units. This means there are likely to be a few people sitting around taking a break. We decided to go for lunch and were greeted by a friendly face who explained all the menu and makes a few suggestions. The table tops are also double as menus, so you can review your choices while you wait. The walls also provide a bit of entertainment, so you can guess the country where each photo comes from while you wait. The menu consists of cold and hot dishes, desserts and a selection of smoothies with a helpful list of calories with them. We chose from the hot menu which has a strong Italian influence – Spaghetti amatriciana, spaghetti pescatora, Pollo al forno (Chicken with rice and vegetables) and a spinach and tomato or a lamb lasagne. We chose the pescatora and the vegetable lasagne. We were asked if we were happy to have the spaghetti spicy. 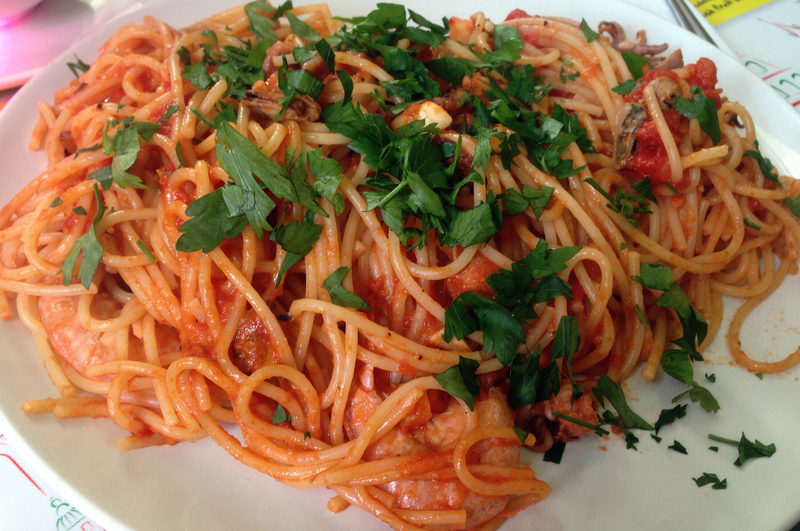 This is hearty food – a large plate completely heaped with spaghetti and the lasagne was a large slab. The spaghetti was OK with enough fish of various types to justify the description although, in the event, not particularly spicy. 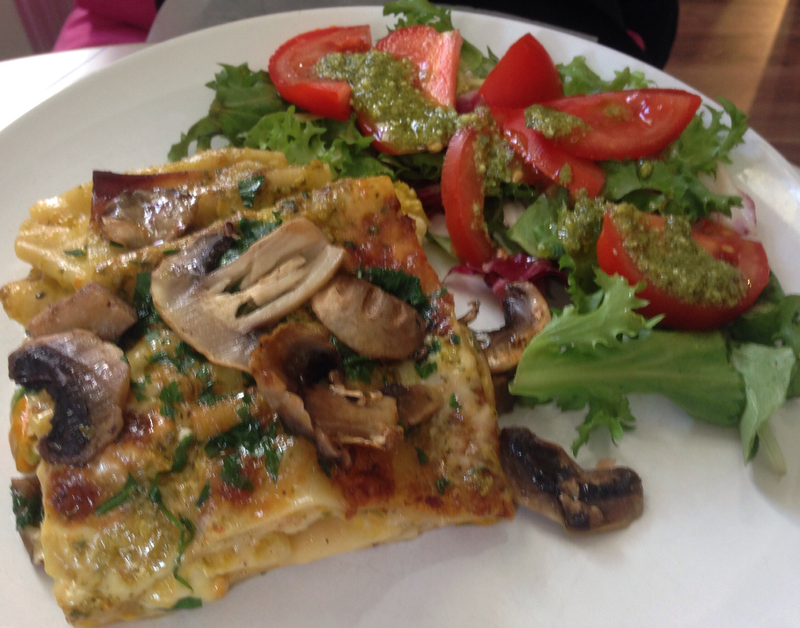 The lasagne was more disappointing – it needed more seasoning and it wasn’t what was advertised on the menu – not a bit of spinach or tomato in sight. We were asked what we thought of the food and mentioned the menu change. It seems this batch was actually courgette and other stuff, so it was hard to see the filling as it didn’t stand out from the béchamel sauce. The saving of the dish was the reasonable helping of side salad, which had an interesting pesto dressing. We drank a coffee and tapwater (which came with ice) but there were lots of smoothies to choose from. We were absolutely full and didn’t finish either of the plates but we will probably only go back to try to breakfast for a little while and will certainly ask for more information about each dish. They seem to be a socially responsible as there is a post on Brixton Buzz about their contribution to the Macmillan Coffee Morning and the coffee was good, so it may be more of a place for a mid-morning snack. The hot dishes were all £5.50 and because of the mix up with the lasagne they didn’t charge for ourcoffee, so it came to £11.00.